It is hard to know where to start with this one. If we go back to where I was a year ago I am barely recognisable as the same player and yet my brain often tells me I have't improved at all. The problem is I can never remember what I have done. Perhaps my biggest regret is not videoing more of the journey, especially the beginning parts. The bits where I could barely hit a ball, where I was losing to my friend Ollie in straight sets, where my girlfriend would beat me on our little table at home and I would get so frustrated. Like anything, however, you never notice progress, you only notice a lack of it. Ironically, it was a session with Ben recently that made me realise how far I had come. We started off doing our usual, backhand and forehand drills and I could put every single one on the table with relatively good technique. The issues I was experiencing were things like: putting more spin on a backhand or finishing in the right place every time on the forehand. Basically, minor things because everything else was right. Now, this doesn't make me amazing or even proficient. It just means I have hit the next stage of my development. I can finally hit 40 or 50 balls without missing on my forehand and backhand. I am winning games and I am starting to show signs that I will be a decent player. The question I keep asking myself is "am I where I want to be at this stage?" It has been tough to decide as the goal posts have kept on moving. I have certainly had times when I thought I wasn't anywhere near where I needed to be. I have three moments that I can recall wanting to quit. I have had a couple of months where nothing has gone right. Even my league matches started with some big wins that felt like I played to win rather than playing to perform, which sucked the joy out somewhat. However, I have also had days where I have felt like I destroyed people. Where I have seen my performance level jump above anyone else's, where it has felt like the hard work is completely vindicated. Admittedly, these are not as regular as the times I feel like it is a long hard slog. Part of that is how big the challenge is and part of it is just my own personality which focuses on the failures more than the victories. So what this means is I tend to distort my own perception of my achievement so far. I think if you asked Ben he would say I am about where he expected me to be and I tend to agree with that. I have not taken to this sport like a duck to water. I have no talent that propels me above others, likewise my own head can hold me back in this game. I also started out with no experience at all. I hadn't knocked about with friends, I hadn't played at school or done it on holiday I was completely inexperienced and that meant I was more handicapped than I even remember. The biggest loss, though, was not having a coach from day one. Ben has changed everything for me. I guarantee that I would be a bit of a mess of a player if I hadn't got lucky with him. It basically restarted my table tennis 'career' and put me on the right track to success. I also want to make the point of mentioning Karl in this, because he was the one who first coached me and continues to coach and do drills with me on a Tuesday as well. The weird thing is, probably because we are all of a similar age with similar interests, I now have a friendship group out of it. We chill together and I probably spend more time talking to both Ben and Karl than my own girlfriend (much to her annoyance). 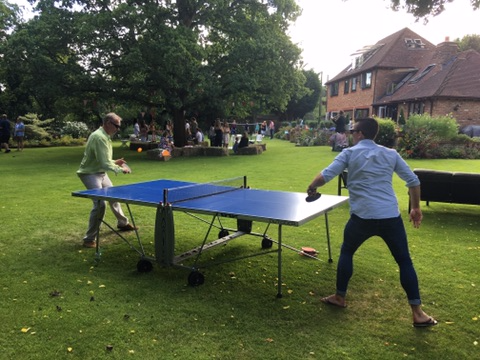 It makes the whole thing bearable when things are tough and I am feeling like rubbish to mess around a bit or discuss something other than table tennis for 5 mins (not that it happens very often!). It also means that it feels more like the Fellowship of the Ring than Taken's one man army style. I like a bit of a team ethic in all honesty. It is probably why I can find the competition element tough in table tennis sometimes. What not having a coach originally and not having any experience in the sport has done, is create a feeling of the unknown. When I started, I assumed I would be X good and get to Z in a couple of years. When I started playing a bit I realised I was actually only T good and X would be a while off. Now I know I am probably about a C and getting to Z will be a long, hard challenge. In simple terms somebody kept extending the challenge. It seems that now I am pretty sure of how hard it is going to be. I think that is partly why I am improving again. I am embracing the enormity of the challenge and not worrying so much about the next level up from me, I just concern myself with mastering my current level. When I watch some of the early stuff with me and Ben (see video to the right) it is amazing how much I have improved, although it is amazing how much I still have to do to become half way decent. I will always maintain that table tennis requires you to learn two different sports. There is the sport for playing the quality players. Big looping table tennis, attack after attack, risk but high reward. There is also table tennis for beating the awkward people consistently. That table tennis is just doing basic stuff well and having no risks in your game at all. At my level, one makes you look like a pro and you win nothing. The other makes you look (and feel) boring but you will win a lot more games. I have basically spent my time with Ben and Karl learning the first version for the majority of the time. However, we have done a bit of work on the latter. When it comes to league matches the only way I have played is the second way. I have watched a few people try and play the big looping game but they aren't quick enough, aren't accurate enough to pull it off. The difference between them and me is that I can always fall back on my boring game. The league itself started about 2 weeks ago. So far I have played in 4 matches for 3 different teams. My first match I won 1 game out of 3. My second I lost them all. My third I won 2 and my most recent I won them all. Ironically, the games I have won the most I have played the worst, highlighting, perhaps, some of the issues from the previous paragraph. I enjoy the league, particularly the idea of focused competition. I like the lack of expectation associated with playing players of similar ability to me. I feel I can get weighed down by my own expectation a bit. I am trying not to play every single game for every team as I am not looking to burnout. Likewise, matches require a very limited scope of play. I need training to help increase my attributes in other areas. I am due to play my first tournament in 6 months. That, obviously is another 50% of my total playing time again (if not more). I would expect myself to be competitive among the lower level players there without setting the world alight. If we were to simplify the journey down into a highlights reel of the best and worst bits so far. My highlights would probably start with the friends I have made over the course of this and the fact I have progressed in a sport I have never played before. I remember my tournament where I reached the semi-finals as a particular highlight. My second memory would be going to a club that I had been the worst at 3 months or so before when I visited and returning and suddenly being a guy in the middle of the pack with respect from almost every player I was with. The biggest highlight with Ben was my last session. I finally felt like I was a consistent player and I could play table tennis. I was pretty ill that day and I worked so hard that my t-shirt only had a tiny little square of dryness left on it but I felt progress, I felt like a table tennis player. My biggest lows have come when I have had losses that I was shocked by. The mental side of the game, I have said many times, has been incredibly tough on me. Two of my lowest moments have come at Ben's club. A variety of reasons make that place difficult for me. It is ironic that it is one of the most welcoming, warm and friendly places you can go to, to start learning table tennis. I dread it because I am the top of the pile and I am under the watchful gaze of Ben, who I constantly seek to impress (I am a bit of a loser!). It has led to some awful table tennis and bitter disappointment, which has been pretty self-inflicted. I have had the same things at a couple of other clubs. All have been in similar circumstances. Usually against lower level players, where I have been expected to win and perform well and I have just frozen. Often I have been around people I know. I am not going to lie, I have sometimes wanted to cry I have taken it that hard. Like all the work and sacrifice has been for nothing. However, I have usually recovered stronger and come back a better player. I thought I had got past the "fear" of playing low level players and men I know who are around my level and look at me as a scalp. This weekend proved I hadn't. Which disappoints me. I still feel if this journey is, truly, going to be a success it will be this that I must overcome. To even keep a blog about a year's worth of hard work to this length has been stupidly hard. I regret not videoing myself more when I sucked. I genuinely think that would of been interesting. I was too scared at the time that I looked like a moron so I didn't have the balls to do it but these blogs are a real eye opener. I have made progress, I cannot tell you how close I am to achieving my goal I am. I have no idea if I am on track to do it or if I am behind the curve. I don't think you can measure this very easily. All I know is I am 1/8th of the way in. I have basically graduated from "what is table tennis" to "I play table tennis". That transition in itself has taken some time. It has been way harder than I expected. It has been the never ending marathon. I have put a lot of miles on the car travelling to various clubs, I have spent more than I ever expected on bats, balls, tables and more besides. I have made life long friends and I have had so much fun with some of the weirdest and most wonderful people. I am certainly, well known in my little area of the table tennis community and I guess that is something. Perhaps most of all it has filled a hole in my life that both athletics and rugby left behind. Bodybuilding and swimming etc. could never fill the hole the same. I am glad to have found table tennis and to see this 'Epic Journey' through. This website basically beautiful points and things right. Much thanks for this valuable article. I discovered your online journal utilizing msn. From the very first words that attracted me and drew my attention to your post, it was great !!! This is a great inspiring article. I really appreciate for this great information. I recently found many useful information in your website especially this blog page. Among the lots of comments on your articles. Thanks for sharing. I am cool with the page and fine with it being an open page. I only bring it up because there was recently a thread on the page discussing the open nature of the page. During that thread it was pointed out that the church opted not to operate a facebook page and so several congregants began and administer the page. There seemed to be a lot of folks who were surprised or had forgotten that the page was unofficial.